Product Note: The limited edition poster has SOLD OUT as of November 9, 2018. 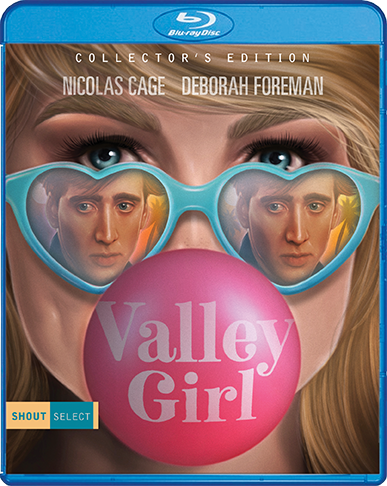 Nicolas Cage and Deborah Foreman star in the totally awesome comedy Valley Girl! When Julie (Foreman, April Fool's Day, My Chauffeur) dumps her preppy boyfriend, the last thing she expects is to find love with the rockin' Randy (Cage). The future's open wide for Julie ... but when her disapproving friends (E.G. Daily, Heidi Holicker, Michelle Meyrink) find Randy to be grody to the max, she is caught up in a culture clash between her Valley lifestyle and her Hollywood punk. Featuring a so-bitchin' soundtrack packed with New Wave hits, Valley Girl is a sweetly romantic slice of 80s nostalgia from director Martha Coolidge (Real Genius). Are you going to love it? We're, like, so sure! NEW Extended Interviews From 2003 With Nicolas Cage, Cameron Dye, Frederic Forrest, E.G. Daily, Heidi Holicker, Colleen Camp, Lee Purcell, Producers Andrew Lane And Wayne Crawford, Peter Case Of The Plimsouls, Josie Cotton, DJ Richard Blade, And More!